I hope and pray that each of you enjoyed your Thanksgiving Day surrounded by family ,friends, love, laughter, warmth, & full tummies. 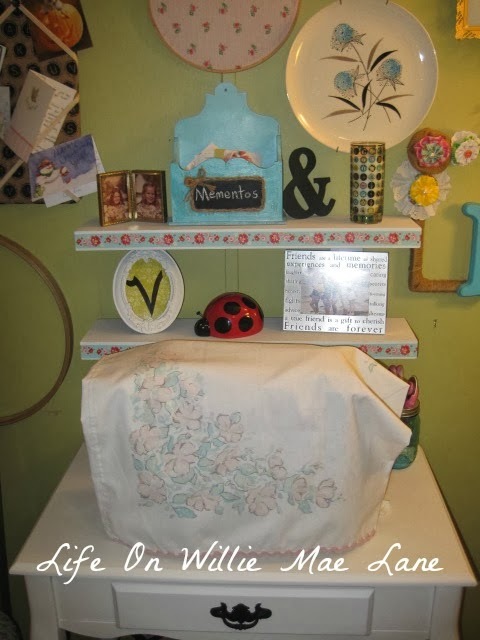 A Home for My Sewing Machine! Wow! Is it really Wednesday? This break of mine is flying by...but in a good way! 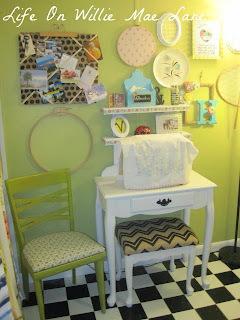 The hubby and I have been busy bees working on our spare bedroom and I am close to being finished....but not quite! 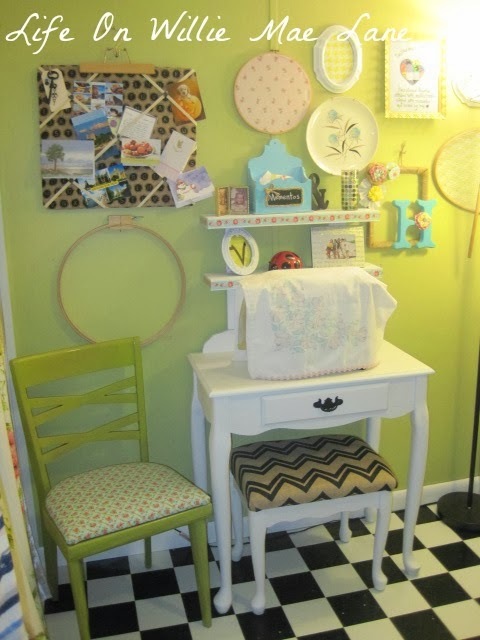 In addition to the various projects going on in there, I have been working on a project in my craft room. You may remember the little vanity I shared a couple weeks ago. You can see it in the photo below on the left prior to it's makeover. The right side shows it after it's makeover. I just love how it turned out. 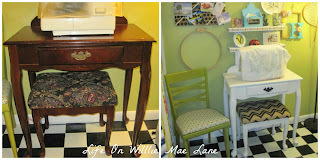 This was the ultimate thrifty project since my mother in law gave me the little vanity to use for a sewing table. I had all the supplies on hand to make it over. 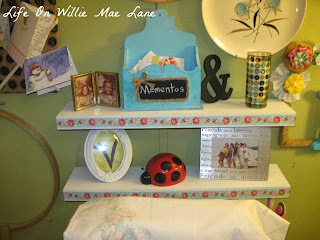 I love the shelves the hubs added for me to display things. I had bought these two shelves a year or more ago and had no idea what to do with them. I was actually about to get rid of them when we had the brainstorm to add shelves to the table. These two could not have been more perfect for the job! That's my sewing machine under the vintage pillow case. I still need to add ribbons to the sides to tie it on. The bench got a new outfit in some lovely chevron burlap I purchased a while back. 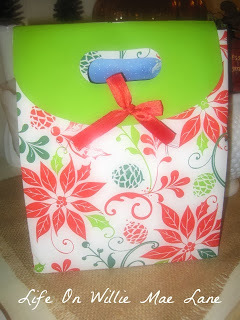 I love this wrapping paper I bought at TJ Maxx a few months ago! You can see how the hubs attached the shelves here. There were holes already in place. I'm sure there used to be a mirror on it. 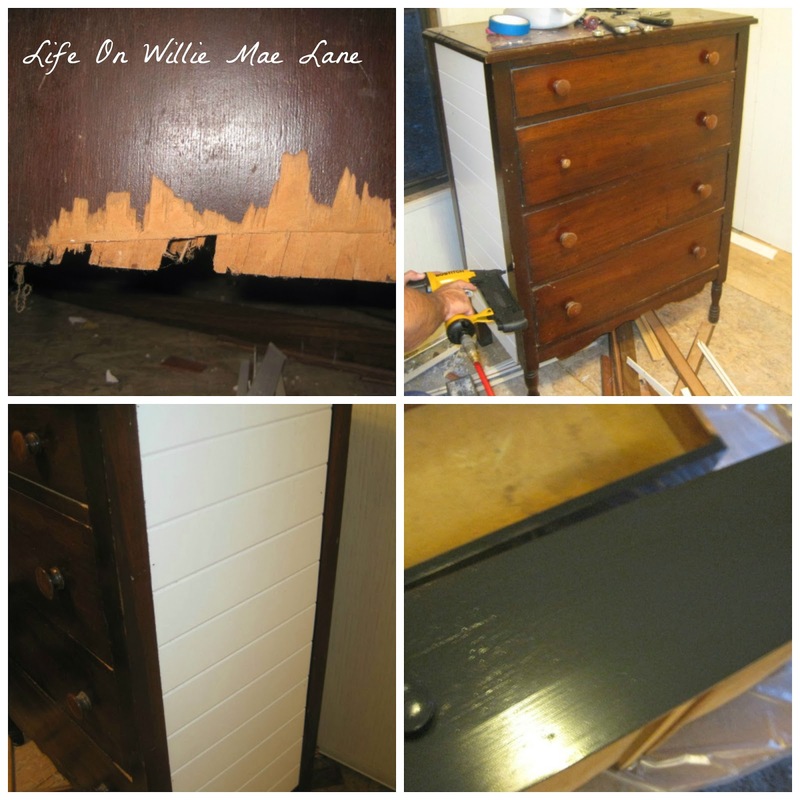 He used carriage head bolts to attach it all together and it is very sturdy! I just love it and am thrilled to have a permanent home for my sewing machine! Well my friends, I really ought to get to bed....it's after midnight! I've been working nonstop for 2 days now and am exhausted...but satisfied with the amount of work we have managed to accomplish. It rained ALL day Tuesday which threw us off schedule for one project, but it will just have to wait! I'm happy to report that I have a quick trip to the thrift store planned for today to look for something for the new room, and then I need to pick up things to cook for Thanksgiving as well as groceries for my house! The pantry is looking pretty skimpy, as is the fridge! But hey...who has time to grocery shop...lol! So excited my Randa will be home tonight and will be here through Sunday. may each of you have a blessed and happy Thanksgiving surrounded by those you love most. As I was sitting here trying to decide what to blog about tonight....it hit me! There are so many sources of light in my life and I'm not just talking about the kind we just installed in our spare bedroom....although I am sharing because it is so pretty! What do you think? 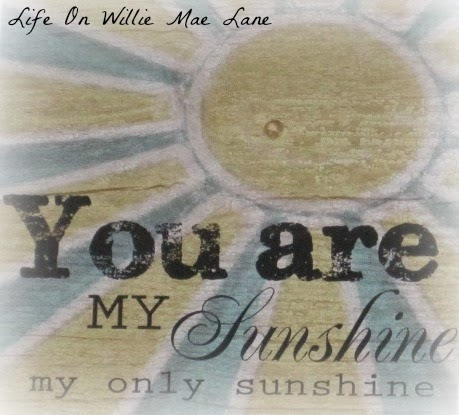 I am talking about those people in my life who are light sources....the obvious, those whom I love dearly....my husband, daughter, son, mama & daddy, sister, nieces and nephews, mother-in-law, aunts & uncles, cousins, best friends, & students (both former and current). 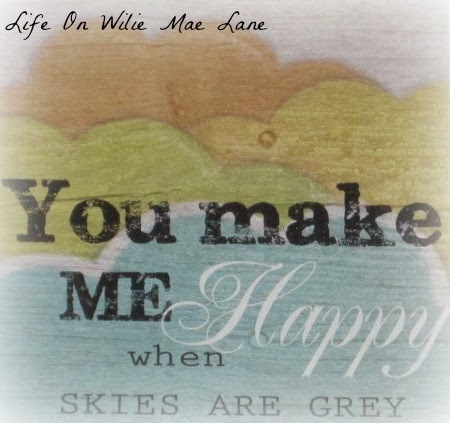 Then there are those who bring a smile to my face when I hear from them.....those who have so much in common with me.....you.....my blog friends. I am amazed at how many of you I have become friends with over the past 11 months and I am grateful for each of you. 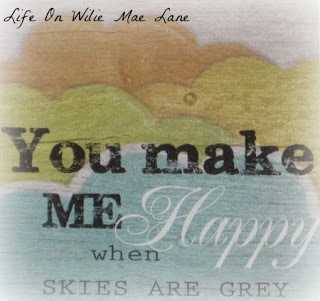 Your visits and comments leave me with a warm glow....and I love that. Each of us have so many sources of light in our lives if we just take the time to acknowledge and appreciate them. Each of you are a source of light in my life. I wanted to share a little of the spare bedroom we have been working so hard on. The light makes me so happy...I love it! I also love the artwork I found today....sneak peek below! I have always loved this song and thought these would be perfect in the new room! One of my biggest light sources, my daughter Miranda, will be home Wednesday night for 4 glorious days and nights and I can't wait! I hope she loves the new room....:) I know I am loving it and can't wait to finish it and share the entire thing with you. So close...yet so far! I am in the middle of a few projects, but it will be done by Wednesday night, somehow! Thanks to each and every one of you for being a source of light in my life. You are loved and appreciated and make me oh so happy. Have a lovely Sunday evening my friends. 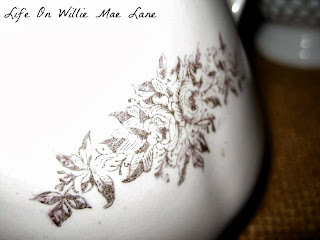 I have a few totally random things to share with you today. 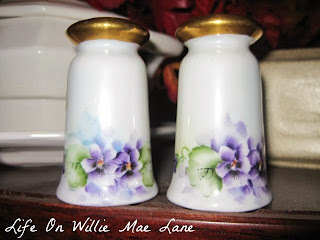 First up are these absolutely gorgeous violet salt and pepper shakers. 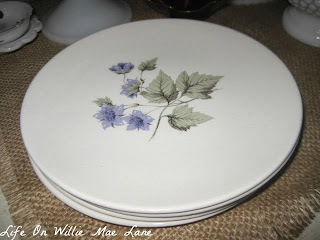 I came home yesterday to a package from my dear friend Beverly from Tablescapes by Bev. You may remember Bev sending me these lovely strawberry linens a few weeks ago. Well...she surprised me again! 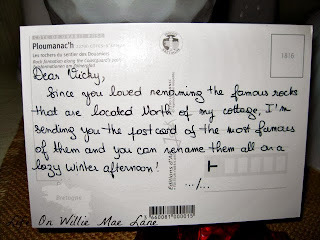 This time, she sent these as a thank you for my hosting the ornament exchange. She had read about my love of violets and decided to send me these. Bev is fond of her S & P's so this was a super sweet gesture and certainly not expected. 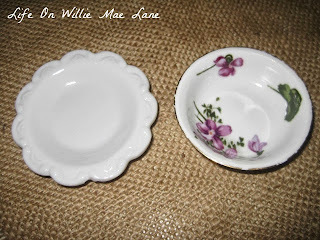 She bought them from the same estate sale where she bought the strawberry linens. Thank you Bev...you're such a dear and not just because you sent me such sweet gifts. 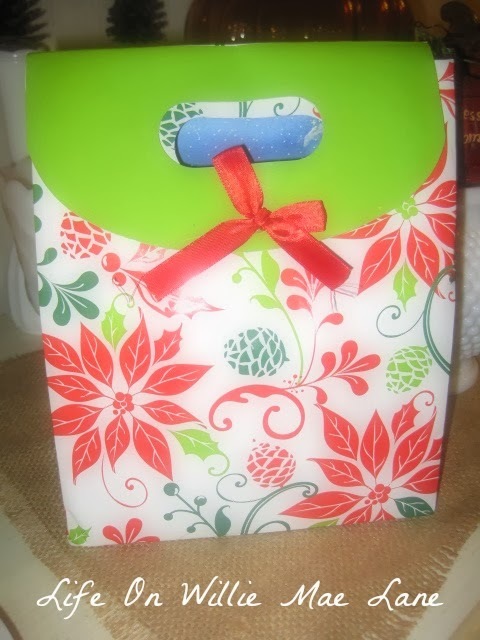 Your participation in the exchange as well as everyone else participating and having fun was gift enough for me! 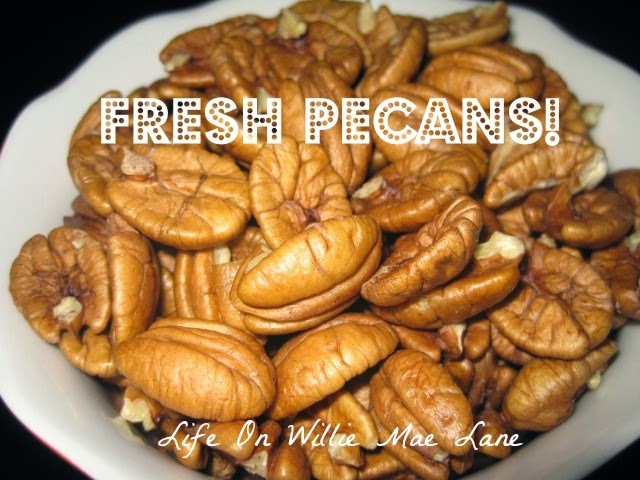 Check out these beauties! They will look lovely with my violet collection. You can see that here! He asked me if I liked them and of course I replied....I love them! So sweet of him to share...:) They are so yummy....I already sampled a few! 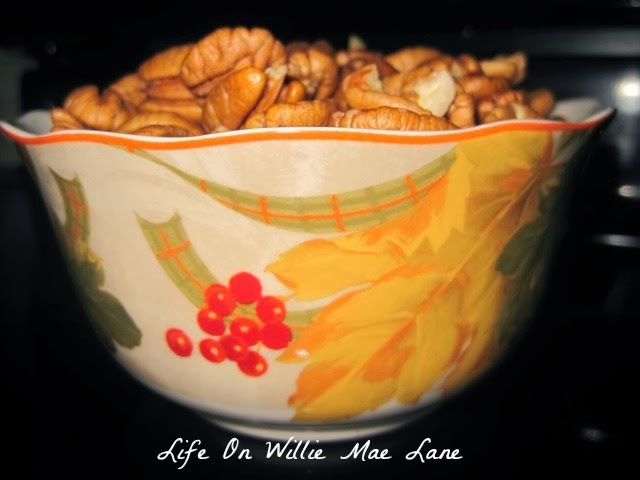 I had to pour some in my fall leaf bowl just to see how pretty they looked in there. On to my next topic. (I warned you this was a random post...lol) If you have read any of my most recent posts, you know we are working on my spare bedroom. 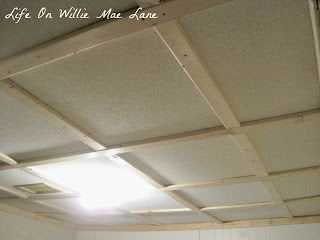 I shared the photo on the left the other day of our board and batten treatment on the ceiling. Well, we (or I should say the hubs) painted it and here is how it looks now. This was taken in the dark so the quality is poor but you get the idea. I LOVE it! And the best part is, we did it with furring strips which only cost $1.25 each for 1" X 3" X 8' pieces. 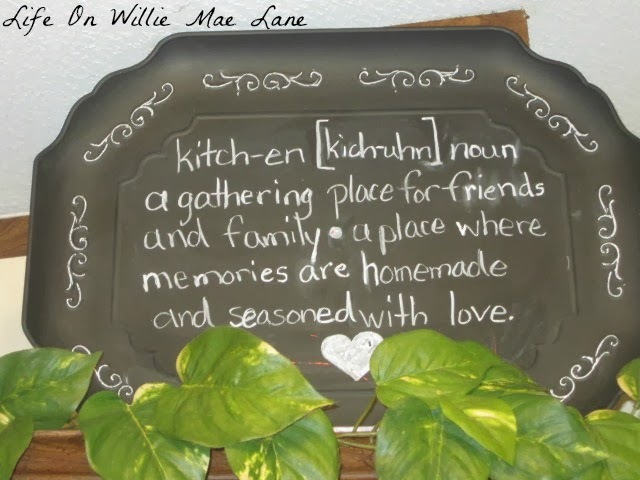 We are always on a budget and do all our remodeling and projects on a cash only budget. Not bad for less than $20 if I do say so myself! On to the next project! You might remember this rack I bought a couple weeks ago. While I was in the closet, I decided to snap a picture of my homemade necklace holder I made a couple years ago. 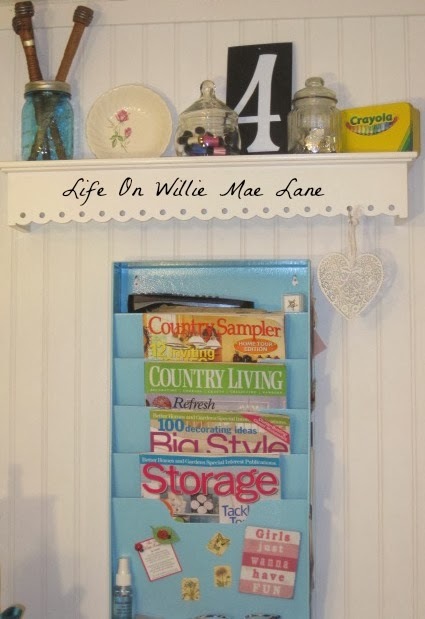 It is made from a drawer front from a nightstand that had seen better days. I used the existing knobs, had the hubs drill 3 more holes, moved the original knobs to two of the new holes and put three green plastic (although they look like glass) knobs in the other 3 holes and voila!...a necklace holder. 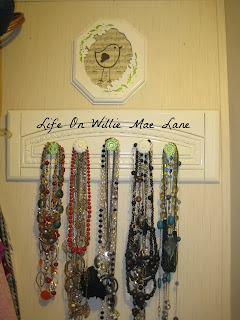 I was inspired to share this after seeing Tina's (from Cluttered Corkboard) homemade jewelry holder she shared this week. She is having a giveaway for one, so you need to hop on over there for a visit and enter to win!!! 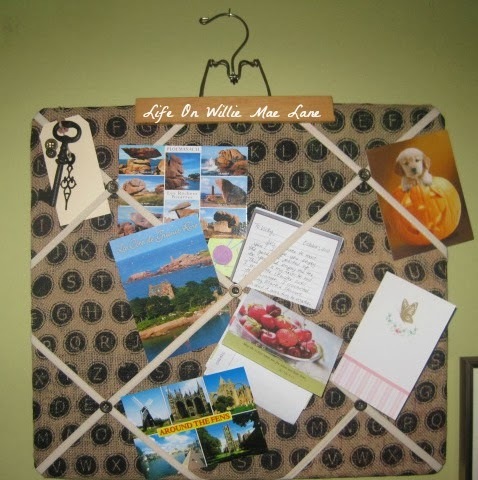 She shares the best homemade items and makeover items and is always budget friendly! 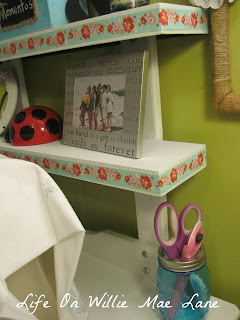 In case you were wondering about the picture above the jewelry holder, I made it too. 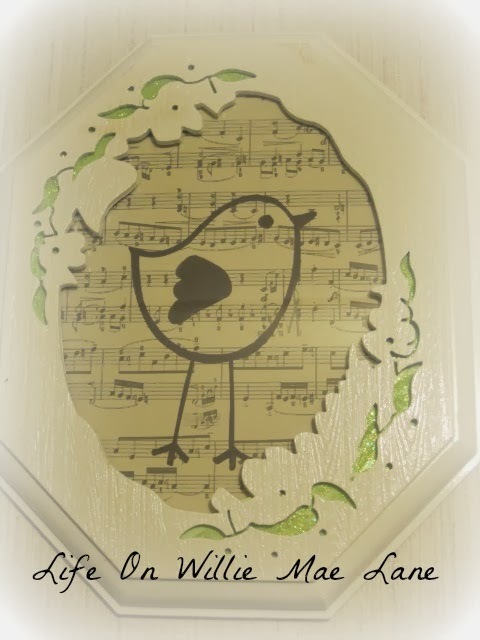 I used a thrifted frame, repainted it, glittered some paper to put behind the leafy cutouts, drew a tweet sweet little birdie with Sharpie on old sheet music and instant artwork! Artwork to me anyway...lol! 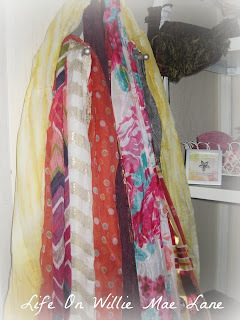 A couple years ago, I tried to spruce up my closet and make it cute. I would share more, but it is in need of another purge and clean out! So...maybe another day! I started my Christmas shopping via Amazon this week as well. Have any of you started? I want to get it done early this year since we will be remodeling in the midst of all the hustle and bustle. Kinda nervous about that, but so excited too! I hope you all have a blessed weekend! The hubs and I are headed out to Tallahassee early tomorrow morning to pick up our new flooring! I am so excited....:) We are going to meet Miranda for breakfast too, so that's just the icing on the cake! A Few Treasures & a Makeover! 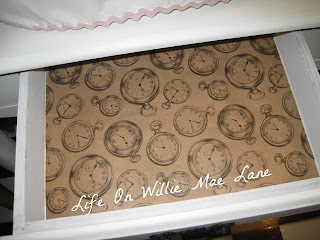 Wow....I can hardly believe I have time to blog on a Monday night! I have had a productive afternoon and evening since my boss told us to go home early today after the kiddos left. I definitely took her up on that offer and came home to get my package for the ornament exchange finished so I can mail it tomorrow. I have to stay late at school tomorrow night for a parent night we are hosting. I am on the parent involvement committee so I have to stay. I am super excited that next week is Thanksgiving and we have the whole week off from school. Nine glorious days in a row....bliss! 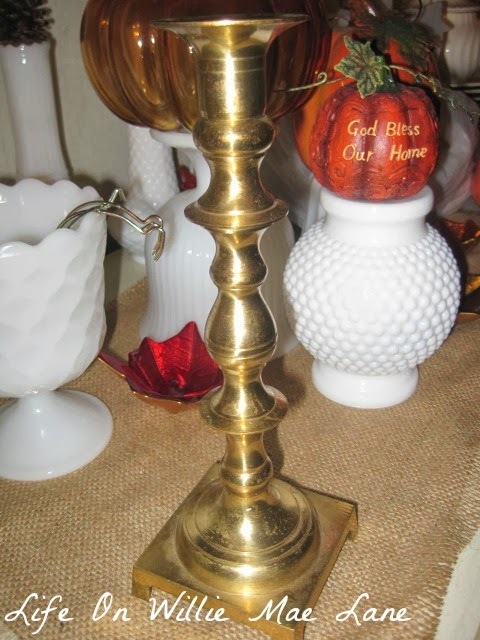 First up is this brass candle stick. I love the brass and think it will look nice in a fall vignette. It would also be pretty spray painted. Not sure yet what I will do with it, but for $1.25 it came home with me. 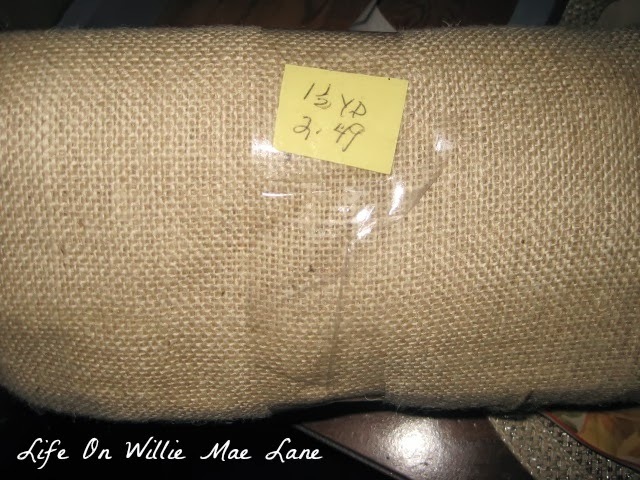 This burlap is a lighter color than the burlap I already have and it was only $1.25. Couldn't pass up a deal like that. This frame was to pretty to pass up. It is scratched up a little, but will look good as new painted. It was just $1. This sweet little ironstone pitcher had to come home with me. It is pretty old and I love the gold floral design on it. It was $1.25 or $1.50...can't remember. There are three of them around the base. These dessert plates were just $1.25 for the set. 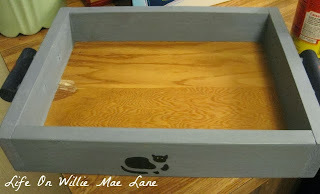 This sturdy wooden tray is ugly right now. It looks like a leftover from the late eighties in that country blue...lol. Fortunately, I can see beyond the ugly paint job and see it repainted with a nice graphic in the bottom and maybe some new glass or rope handles...:) It was only $1.25...too cheap to pass up. 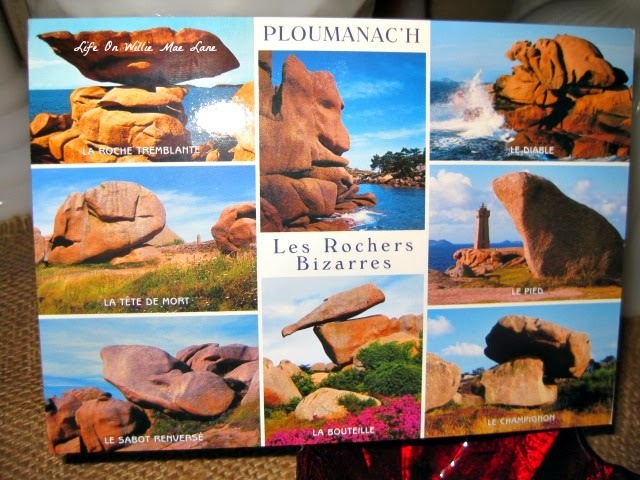 I am planning to use it on the corner of the bed in the new spare room. 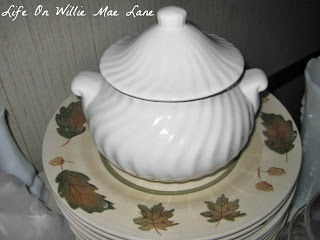 I was fortunate to find another soup tureen, although this one is really small and missing the ladle. I love it though! It was just $1.25. Last up are these two sweet little bowls. They were $1 each. You may remember my violet collection I shared here earlier this year. Isn't this just the sweetest little thing? 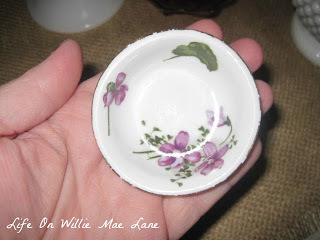 It has joined my other violets in the china cabinet. Love finding such great deals, especially on things that I actually collect. One last thing! I wanted to share a little makeover I finished. I started with this red tray I bought at Kirkland's a couple years ago. It is really pretty, but I had other plans for it. I turned it into a chalkboard! What do you think? Never mind my not so neat hand writing. I need practice writing with chalk...lol! 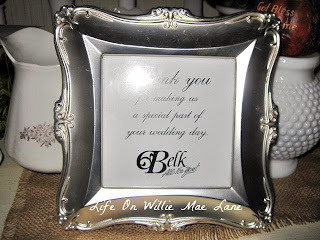 Simple Blessings and a Couple Makeovers! Hello and Happy Sunday everyone! I do hope this finds you having a lovely day. I have had a very productive weekend so far and have had some fun along the way too! Friday after work was pretty much a lazy evening trying to catch up on rest from the week. Saturday morning, the hubs and I got up fairly early to head to Lowe's to buy the trim for our spare room as well as a few other needed items. I am lovin' the room transformation and can't wait to share!!! 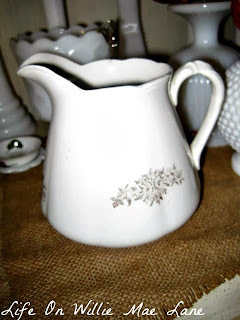 So many of my thrifty finds are going to find a home there...:) We have decided to tackle the living room next and I am beyond excited about that! These renovations have been a long time coming and I am happy and thankful to see some things finally coming to fruition. So, off to Lowe's we went and purchased the trim, some paint, and a few other items. We also purchased a pretty exciting new toy for the hubs....a Wagner paint sprayer! 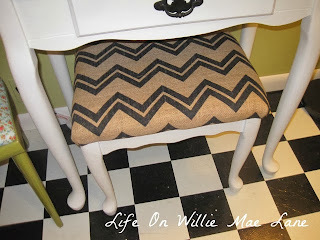 This will make painting each room as well as furniture easy breezy and so much faster! 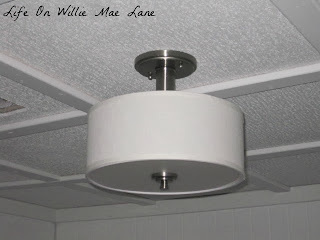 We also purchased the light fixture for this room. Remember I live in a mboile home and they come with the most unattractive light fixtures. 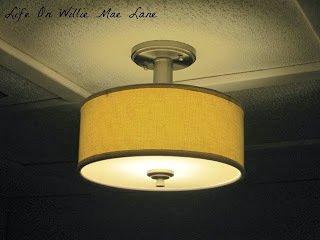 Well, we were able to find a gorgeous light fixture by Allen & Roth that was originally $68, reduced to $25...score! I was very excited about our good fortune. I also ran into Michael's to pick up a few things which I will share soon. We went to Texas Roadhouse for a quick lunch and then went by Wal Mart to pick up a few necessities and headed home. We had a very productive evening working in the spare room and I got some house cleaning done, cleaned up my craft room a little, and sorted through numerous junk piles which I removed from the spare room. I am happy to say that so far I have gotten rid of 4 boxes of junk! I want to share a couple blessings I have had recently. 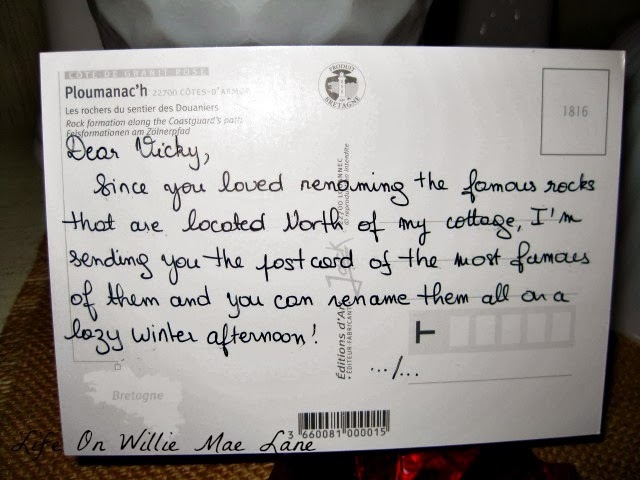 First up are these sweet postcards that Magali from The Little White House On the Seaside sent me. 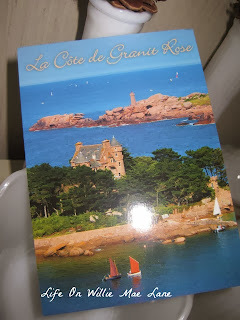 She was so kind to offer to send me one after she read my post about my message board I made to keep up with correspondence from my blog friends. Magali lives in France and I was thrilled to receive not one, but two postcards from her, complete with very sweet messages on the back. I have of course added them to my board! 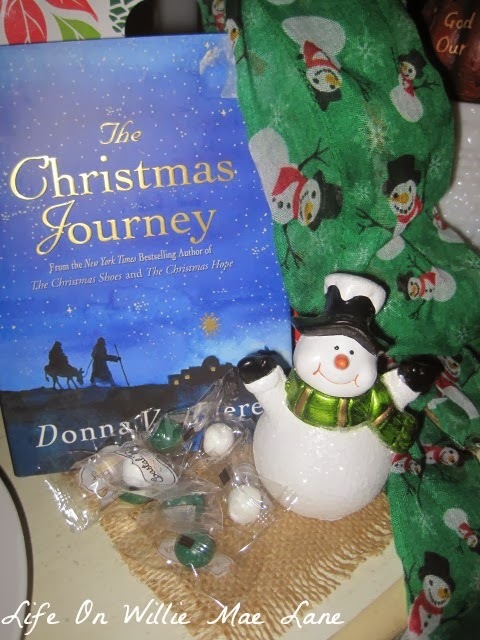 A book by one of my favorite Christmas book authors, an adorable little snowman to add to my collection, a snowman scarf, and some mint candies. She knows me so well and picked things she knew I would love. She is so thoughtful and is the best sister and friend a girl could ask for. God blessed me greatly when he gave me her for a little sister all those years ago. If you're reading this Nancy, thank you and I love you. I also have a couple little makeovers I wanted to share. You might remember this little shelf I bought recently. Well, it didn't need a makeover, but we got it hung and I have a sweet little vignette on it and wanted to share. 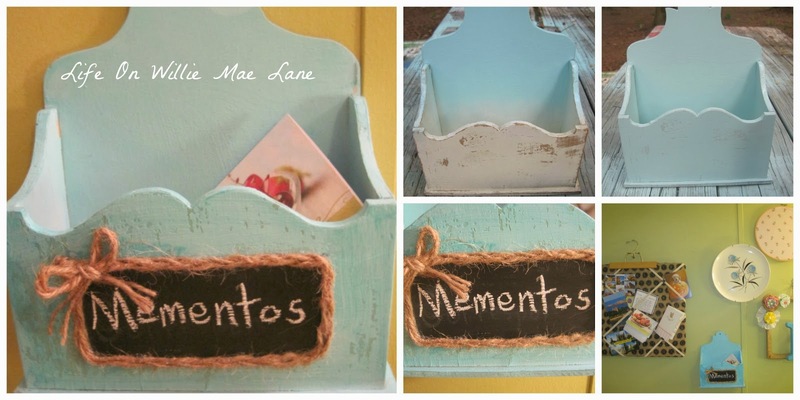 I also made over this little wooden box to hold letters and cards when my message board gets full. 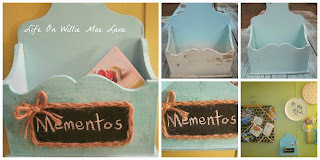 I can take some down and add new ones and keep them in this sweet little box I made over. It is pretty old and not in the best shape, but I love the old distressed look. I also painted the lids to these cannisters with chalkboard paint so I could label them with the contents. They were white before like the base they are sitting in. 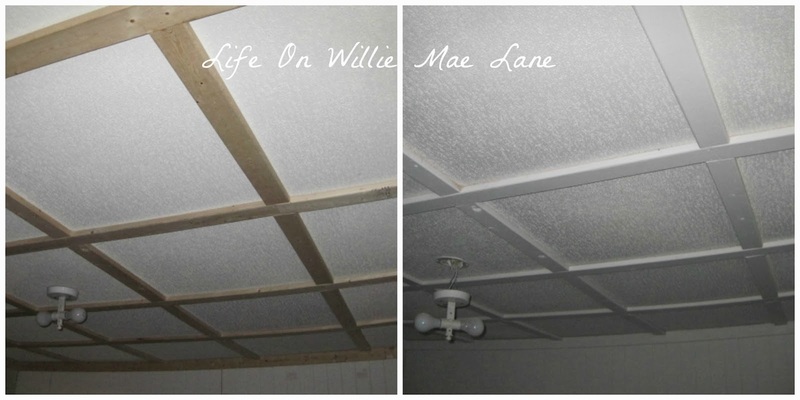 And....just because I can't stand it....here's a little before and after of the ceiling project in my spare bedroom. This is a HUGE blessing! The hubs has been hard at work and I am loving it. We had a leak a while back and had a huge water stain and some sagging in the ceiling, so to keep from having to replace the entire ceiling, we cut a section out and replaced it. 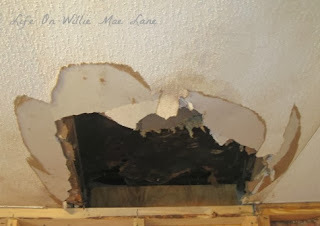 The picture below is after we tore part of it down....gross, I know! To keep from having to patch the seams and risk it looking bad, we decided to do a board and batten type treatment.